milly and tilly: Lots of Popcorn! On Tuesday I invited friends over to watch TiMER, a romantic comedy I have been waiting months to see, and made lots of popcorn for everyone to eat. There were three varieties: Buttery, Parmesan and Spice, and Chocolate and Pink. For each type I started with air popped popcorn. 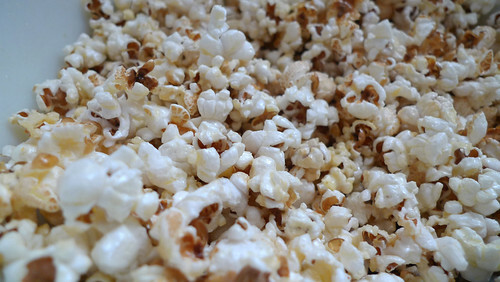 For the Buttery Popcorn I drenched it in melted butter and sprinkled on salt. 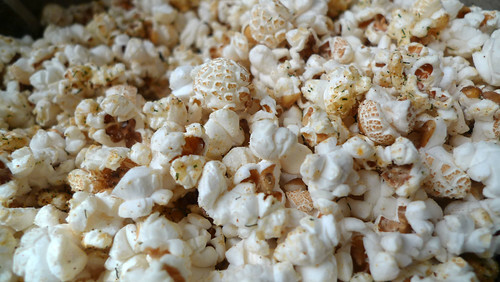 The Parmesan and Spice Popcorn was a modified version of this Spicy Popcorn from Lisa's Kitchen. I think I over did it on the Parmesan and didn't add any amchoor because I didn't have any. I had never heard of amchoor before, I am quite intrigued by it and will have to try some soon. 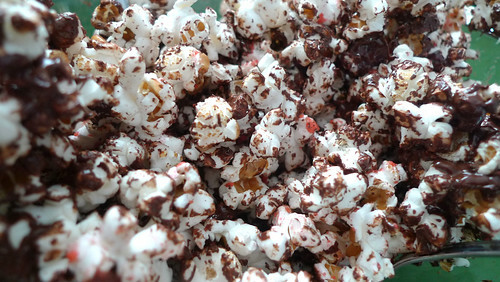 The Chocolate and Pink Popcorn followed this Pink Popcorn recipe from Erin Cooks. I obviously used chocolate for most of the coating; there were some technical difficulties while trying to melt the white chocolate... it turned into a chunky paste instead of becoming smooth. I tried to make do, but it just wasn't working. If you try this recipe I definitely suggest you avoid using cheap white chocolate chips. 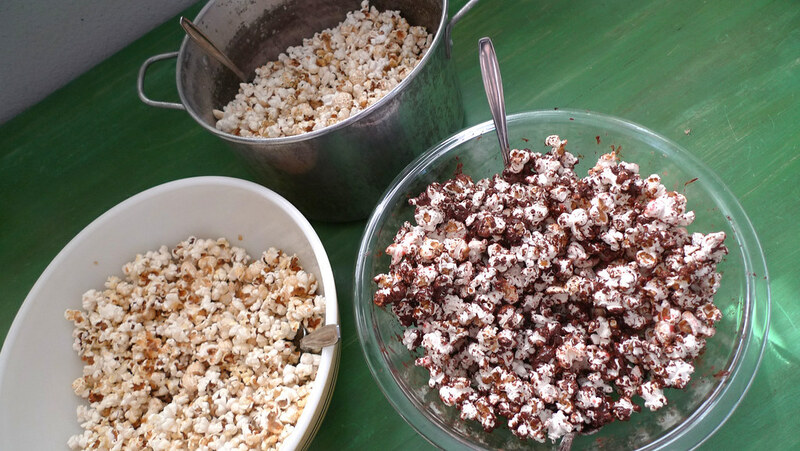 There were a few other popcorn recipes I wanted to try, but didn't. Maybe sometime soon I will try these: Maple Bacon Popcorn from Eat Make Read and Buttery Cinnamon Sugar Popcorn from Purple Foodie. Yu-ummm, better than the microwave variety. I might have to go looking for amchoor myself, always like to find new flavors to try. Did you add liquid food color to your white chocolate? I think that may have added to your technical difficulties – some chips glob up when they come into contact with water :-) No matter, it looks yummy too. The popcorn was really good!